The School of Research Science (SRS), Dubai was founded in 1998, and currently provides a high quality education to over 3,000 students from both local Emirati and non-Emirati families. Representatives from the school initially met with Titus Learning at the annual GESS conference in Dubai to discuss their plans for providing a best-in-class learning platform to their staff, students and parents. From that meeting, we arranged a more in depth consultation which enabled the Titus Learning team and representatives from SRS to collaboratively draw up a list of requirements for the new platform. We agreed on a managed Moodle installation, which would be integrated with the School’s SIMS management information system. 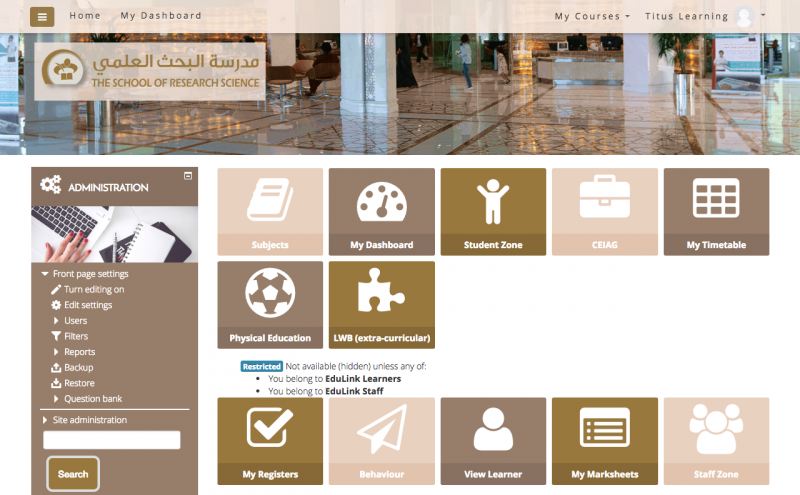 We created a bespoke theme for the new SRS Moodle platform, tied in with the School’s brand guidelines. 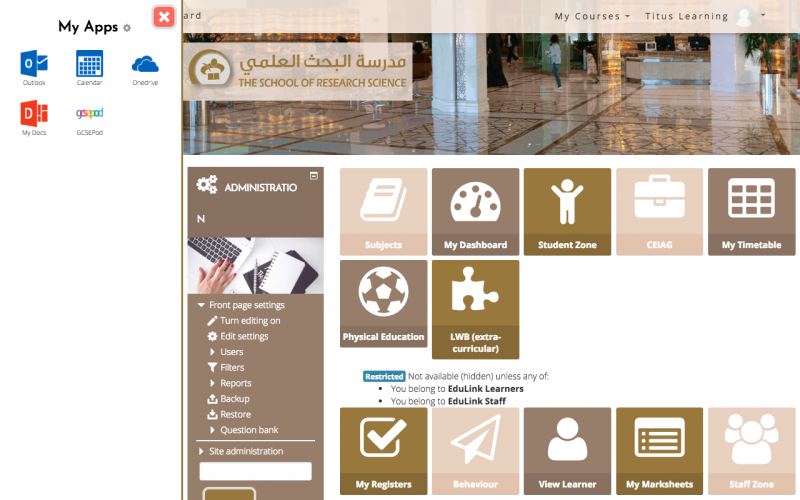 The layout of the new theme was designed primarily for ease of use, to ensure that staff, students and parents alike would have clear access to the most relevant elements once logged in. The design is also responsive, adapting automatically to fit desktop, laptop, tablet or smartphone screens while remaining easily navigable. The new Moodle was installed and configured on a server located on-site at SRS. The main reason for this setup was the improved performance and reliability of the platform when used in school (the majority use case) as well as the improved integration with SIMS. Although the Moodle is hosted on site, Titus Learning have continuous remote access for the purposes of monitoring and managing the system, allowing them to apply updates and patches as necessary. During the installation phase we also set up integration of the Moodle Platform with SIMS, allowing sharing of attendance, behavioural or assessment data between staff, students and parents in real time, as well as automating administration tasks such as enrollment of students or updating of gradebooks. Prior to launch, we delivered 3 days of bespoke training, held on-site, to ensure all key staff were confident in using the new platform from day one. We also put in place a tailored implementation plan to support the launch of the new platform and ensure adoption and engagement from all user groups. Following the launch, we put in place a proactive support programme, providing guidance and advice to SRS on an ongoing basis. As well as reviewing the Moodle to ensure it’s meeting the school’s needs, we stay in regular contact with teachers and administrators to suggest alterations, improvements or adjustments on an ongoing basis. We continually monitor the platform, looking at performance, speed, availability and user activity, and keep in touch to let SRS know if there are things they should be doing to keep activity and engagement high. Following the launch of the new Moodle, we’ve received positive feedback from staff at the school about the qualitative and quantitative effects on day-to-day teaching and learning at SRS. We continue to work closely with the team at SRS, and look forward to collaborating on the next stage of e-learning at the school.